Celebrate National Pisco Sour Day by discovering a little more about the history and culture behind this traditional Peruvian cocktail. We had a chance to sit down with food writer and chef Nico Vera of the site Pisco Trail to chat about his favorite cocktail, the Pisco sour. First up, learn how to make this Peruvian classic. Mix the Pisco, lime juice, simple syrup and egg white in a shaker. Add ice and shake for 1 minute to create a thick egg white foam. Serve strained in a coupe, and garnish with 3 drops of Angostura bitters. To make the simple syrup, combine 1 cup sugar and 1 cup water in a saucepan, bring the mixture to a slow boil, stir and simmer until the sugar dissolves completely. Pour into a Mason jar and let the simple syrup cool before using. A twist on an old classic, this version of the Pisco sour packs a bit of heat due to the habanero simple syrup. Mix the Pisco, lime juice, habanero-infused simple syrup and egg white in a shaker. To make the habanero-infused simple syrup, slice 2 habanero peppers in quarters lengthwise, remove the stem, seeds and veins, then add the quarters to a saucepan with 1 cup sugar and 1 cup water. Bring the mixture to a slow boil, stir and simmer until the sugar dissolves completely. Strain into a Mason jar and let the habanero-infused simple syrup cool before using. Peruvian cuisine is up-and-coming and trendy, packed with great history, delicious recipes and amazing cocktails like the one we are celebrating today alongside chef Nico Vera. Born in Peru and based in San Francisco, California, Nico Vera is the founder as well as food writer and chef of Pisco Trail, where he specializes in Peruvian cuisine and Pisco mixology. Pisco Trail’s mission is to promote Peruvian food and culture through pop-ups, dinners, classes and events that are a gastronomical tour of Peru’s cuisine and its unique culinary history. 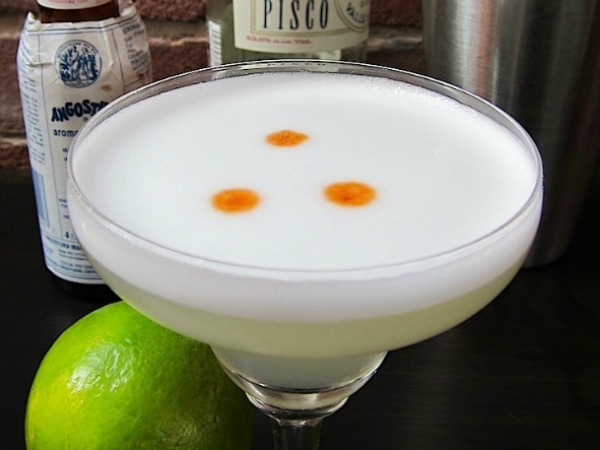 SheKnows: Tell us a little about the history of the Pisco sour. Nico Vera: The Pisco sour is the national drink of Peru, and all over the world we celebrate Pisco Sour Day on the first Saturday of February. Many Pisco historians place the birth of the Pisco sour during the early 1920s at The Morris Bar in Lima, Peru. There, Victor Morris, an American from Utah, is said to have created the Pisco sour — perhaps after finding inspiration in cocktails such as the whiskey sour or silver sour. Other bartenders in Lima working at the Hotel Maury and Bar Ingles developed the recipe further, likely adding the egg white foam that is such an iconic part of the drink we serve today. But a recent finding of a Peruvian creole cookbook from 1903 — Nuevo Manual de Cocina a la Criolla — shows a printed recipe for a Pisco cocktail that may very well have been the first Pisco sour. Isn’t that fascinating? After all these years, we are still discovering more about the history of this legendary Pisco cocktail! SK: What is “La Ruta del Pisco”? NV: Pisco is the oldest distilled spirit in the Americas and was first made during the early 1600s in the Ica Valley of Peru. There, the Spanish harvested grapes that were used to make wine, but after a royal ban on wine production in Peru from the King of Spain, the Viceroyalty of Peru started to use the grapes to make Pisco. La Ruta del Pisco, or the Pisco Trail is a term used to describe the paths connecting the different wineries and Pisco distilleries in Ica. But I also like to think of the Pisco Trail as extending from Peru to California. During the height of the Gold Rush, ships that sailed from the East Coast of the United States to California stopped in the port of Callao in Peru. And what did they pick up and bring to San Francisco? Pisco! Since I was born in Peru, and San Francisco is now my home, my journey also follows the Pisco Trail, and that has served as inspiration for the name of my blog. SK: What’s your favorite Pisco sour variation? NV: There are so many variations of the Pisco sour, and I love them all so much that it’s very hard to choose just one! The classic recipe mixes Pisco, lime juice and simple syrup with egg whites. It’s shaken, strained, served in a glass and garnished with Angostura bitters. But there are two popular types of variations: using different Pisco macerados or infusing different flavors in the simple syrup. Macerados are made by soaking ingredients such as dried fruit in Pisco to change its flavor and typically take weeks of resting to prepare. As a chef, I enjoy adding different herbs or spices to the simple syrup as I am preparing it, that way I have control over the flavors and intensity. One of my favorite simple syrups is made using habanero hot peppers, which are very popular and accessible in California. 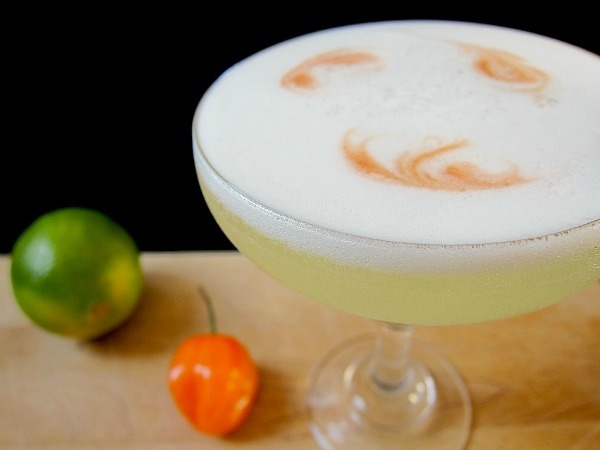 The heat goes well with the citrus and makes the Pisco sour spicy and refreshing at the same time. 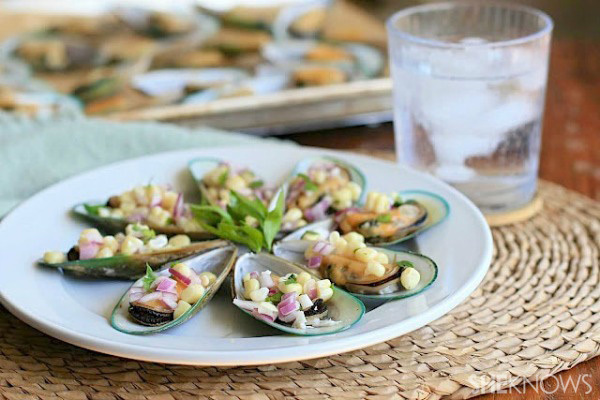 Try these elegant Peruvian mussels with corn salsa while you sip your Pisco sour.